Chalk It Up to Google: Surfing the web is bench pressing for the brain, according to findings of a recent study. "The simple headline here is that Google is making us smarter," says Gary Small of the Semel Institute for Neuroscience and Human Behavior at the University of California at Los Angeles. Thank you, Dr. Small. And thank you, Internet, for not only helping me dig up this information but also juicing up my brain while I looked for it. Small recently published results showing that searching the Internet does for the brains of older folks what doing bench presses does for chest muscles. Small demonstrated this with functional-MRI scans, which reveal real-time brain activity. Half of the 24 study participants used the Internet on a daily basis, and the other half had little to no experience. (Yes, those people exist, and they're easier to find if you look for people older than 60.) First, Small compared the participants' brain activity as they read a book off a computer screen, and both groups produced similar results. But when he examined the groups as they hunted for clues about the benefits of eating chocolate and the best way to visit the Galápagos, the Web-experienced group registered twice as much activity in the frontal, temporal and cingulate areas of the brain — all of which contribute to complex reasoning. Future studies will examine how much the increased neural activity improves — or possibly hinders — intelligence, but Small thinks that the "Web naive" group could build up their brain muscle by logging more time on the Internet. "You keep searching more and more — you lift more and more," he says, "you get more of a workout." 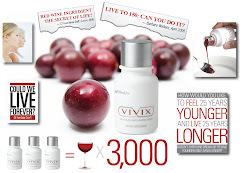 This is Good News for you reading the information I've compiled about Resveratrol Anti-Aging. Yes our resveratrol product called "Vivix" will protect and repair those cells in the brain, but now we know this isn't the only way to improve the health and wealth of our most prized organ our brain. Did you know it takes 7 years for all the cells in the body to be replaced? It does. Now might be a good time to start that clock. Research til your hearts content, then make an informed decision and take your teaspoon of Vivix daily.